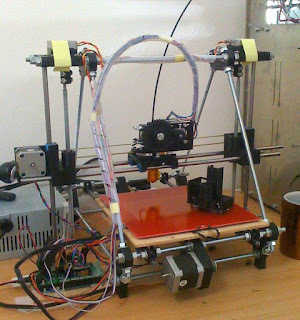 My RepRap is a 1st-generation Prusa Mendel http://reprap.org/wiki/Prusa_Mendel_(iteration_1) which was pretty much the bee's knees in affordable DIY 3D printing back in August 2011 http://julianh72.blogspot.com.au/2011/08/first-post-inspirations.html. The Prusa Mendel and its predecessors truly embodied one of the core philosophies of the RepRap Project: RepRap is short for Replicating Rapid-Prototyper; that is, the 3D printer can (almost) build itself. To this end, the maximum possible number of components were made from 3D-printed plastics, right down to the z-axis couplers and axis bushes. These days, if you start a similar adventure, you are more likely to try building a 3rd-generation Prusa i3 http://reprap.org/wiki/Prusa or similar. To the uninitiated, it is hard to see how the Prusa i3 is directly related by just two generations from the Prusa Mendel, but for those of us "in the know", the family heritage is obvious. You need a power supply with heaps of capacity. I started off with a hacked ATX power-supply http://julianh72.blogspot.com.au/2011/08/my-parts-list-power-supply.html which I thought had enough capacity (16 amps @ 12 volts), and while it did work, it turned out that it had trouble maintaining full supply voltage under heavy load. 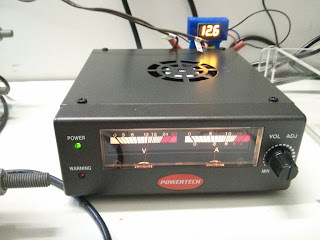 I have replaced it with a more robust true 15-amp sustained (18-amp peak) power supply http://julianh72.blogspot.com.au/2015/10/powertech-mp-3800-0-24-volt-power.html , and it runs much better now. Get rid of the 3D-printed Z-axis couplers, and replace them with engineered metal shaft couplers. You can pick up 5 mm x 8 mm aluminium couplers for a couple of dollars on eBay, and I have found that they grip the smooth stepper motor shafts much better than a plastic clamp - of which, I printed and installed quite a few design variants http://julianh72.blogspot.com.au/2011/11/smooth-operator.html. (This is particularly important for a machine like the 1st-gen Prusa Mendel where the X-Axis is suspended from the Z-Axis motors; possibly less of an issue on the Prusa i3, where the motors are at the bottom, so the couplers are in compression, not tension.) They also run MUCH smoother, as they are able to take up the angular and offset errors between the motor and the threaded rod with a more reliable spring stiffness than the plastic clamp couplers. 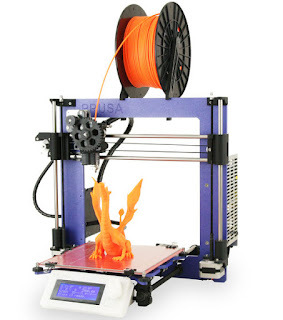 Get yourself an LCD Controller, like the RepRapDiscount Smart Controller http://reprap.org/wiki/RepRapDiscount_Smart_Controller - this will allow you to print without a computer attached, freeing up desk-space, and also removing one link from the failure chain. These can be bought very cheaply on eBay - highly recommended. If you are running an old-generation plastic-bodied print-head (PTFE and / or PEEK), replace it with an all-metal print-head with a heat-sink and fan. These run MUCH more reliably than the old PTFE-bodied print heads, and are also much more physically robust, and are able to withstand the occasional (and inevitable) print-head crash. My 1st-generation Prusa Mendel has had all of the above upgrades applied to it - it is still physically the same arrangement as it stared life, but it now prints much more reliably and smoothly (and faster) than it did before. Dare I think that the "tinker and upgrade" phase has ended, and my RepRap will now enter a long mature life of production printing without significant additional upgrades? I have been powering my RepRap 3D printer with a hacked ATX power supply http://julianh72.blogspot.com.au/2011/08/my-parts-list-power-supply.html - it has been working OK, but I was finding that it could be a bit slow getting the heat bed up to a stable temperature, especially if I want to print ABS (which needs a very hot heat-bed to stick properly). When I hooked up my multimeter, I found the supply voltage was dropping a bit under heavy load, so I guess my power supply really wasn't 100% up to its rated capacity. I started thinking about getting a proper desktop variable voltage power supply. Luckily for me, JayCar recently had a special on several power supplies, including the MP-3800 http://www.jaycar.com.au/Power-Products-Electrical/Power-Supply/Laboratory-Bench/Compact-Switchmode-Laboratory-Power-Supply/p/MP3800, which they were offering for only AUD$119 (usually $149) - not bad for a 0-24 volt power supply, with a load rating of 15 amps continuous at 12 volts (18 amps peak). It is rated to better than 9 mV ripple voltage, and has thermal and overload protection, so it ticks all of my boxes. So I grabbed one, hooked it up to my RepRap, and it works great - highly recommended! The power supply has back-lit analogue gauges for volts and amps, which seem to be pretty accurate when I test against my multi-meter. 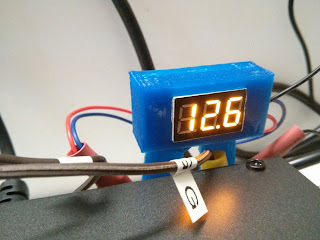 The RepRap pulls a maximum load of about 12 amps during the heat-up phase, but this drops to around 5 - 6 amps during normal printing. 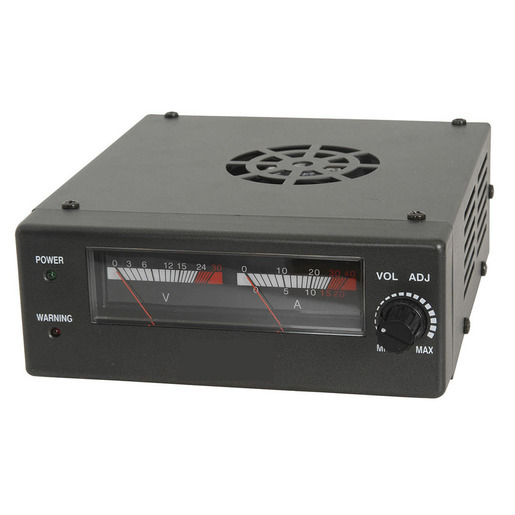 The power supply handles this admirably, with no detectable fluctuation in supply voltage, even when the load is fluctuating rapidly, such as when the heat-bed is cycling on and off. The voltage control knob has a central detent position, at which it delivers 13.2 volts, which is where I normally run the RepRap. (The RAMPS 1.4 card is nominally a 12 volt board, but it can happily take a little bit of over-voltage, and the extra supply voltage gives faster and more stable heat control.) However, I need to be sure to not accidentally overload the RAMPS by giving it 24 volts - I really wanted a digital display to give a crystal-clear voltage display, to make sure I don't over-power my RAMPS 1.4. I bought a cheap 0-30 volt LED voltmeter on eBay for less than $3 including postage (search for "0.36" LED Digital Voltmeter", and make sure to pick one which has the right voltage range for your power supply, as they come in 10V, 30V, 100V and 200V variants). Hook up the red and blue wires to the positive terminal and the black wire to the ground terminal, and you have a nice bright digital voltage display.